Do the words “nutritional supplements” induce your eye roll? Easy to understand. It’s so frustrating to want to take better care of yourself, but to not see or feel intended effects. Like many, chances are that you’ve spent good money on pills and powders that didn’t improve your health or that contained appalling ingredients which you were unaware of – or that were counter to your nutritional goals. CORREXIKO, on the other hand, has an entirely different approach to nutritional supplements. They are believers in clean nutrition, which also translates into transparent and honest branding. They only sell (gasp!) effective supplements. The stuff in the bottle does what it’s supposed to do! They don’t fill their products with fillers and dyes and sweeteners and other elements that you don’t need. The CORREXIKO storefront sells probiotics, vitamins, protein powders and more, individually. They also sell curated collections. The store is easy to browse by category or popular supplements. If you’re looking to give your skin, hair, nails, or entire body a deserved boost, you’ll find something that will genuinely help here. Started in the UK, CORREXIKO has now landed in California, and they ship worldwide. 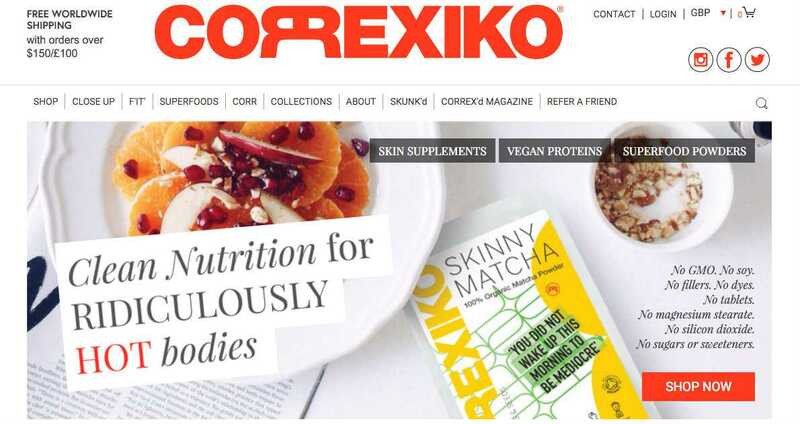 If you’re newbie who’s looking to find your bearings in the world of supplements, CORREXIKO has an online magazine and starter kits to assist. Proteins, superfoods, anti-inflammatories, sun protection, mood enhancers… It IS possible to look and feel great, to add what our usual diets or habits skimp on – without torturing our spirits, tastebuds, or wallet! Tired of your face cream turning your face into a cracked nutshell? Given up on consuming extra nutrients? Ditch the additives and toxins found in other nutritional supplements and explore clean alternatives on correxiko.com.